On May 18th of 2016, we celebrated our grand opening! To commemorate this, we wrote a post on this blog that detailed the shop as it stood at the time. Though much remains the same, since the initial design really captured the feel we wanted, we have made some changes. If you’re a regular to the store, this piece may help you find some hidden gems. If you have yet to visit, this guide can help you find what you’re looking for quickly and easily! Let’s talk about each section very quickly! Keep in mind, when you visit the store, all bottles have the price written on the back of the bottle in removable marker. Most of our selection falls between $14 and $25. We organized the rest of the store the way we did to put this wall in context. 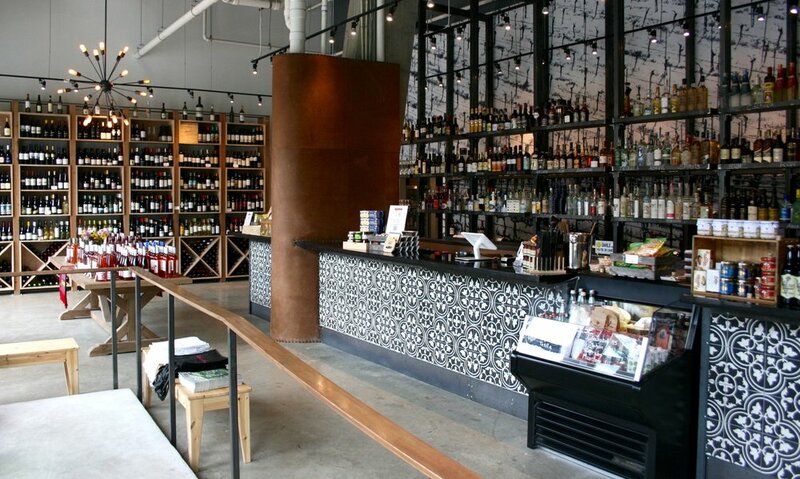 The Latine American Wine Wall is to yourfar left as you walk through the door. While we have all the styles from the two most prominent wine producing nations, Argentina (the first two rows from the right) and Chile (the next two and a half), we also specialize in wines from less famous regions. Brazilian wines, for instance, can be found on the far left on the bottom shelf, and wines from Uruguay in the next column to the right. We also feature Bolivia and Mexico, as well as some domestic wines. In this last case, each wine must pay honor to our theme. As an example, we carry wines from Shafer because the winemaker is Mexican-American - and his work is exceptional! Spain, in the next two after that. Also in this section you’ll find our sparkling wines. Here and our “Hall of Fame” are the only parts of the store where wines from the New World and Old World are mixed. You’ll find exquisite Cavas, Traditional Method (Champagne style) Sparklers from Brazil and Argentina, Prosecco, Lambrusco, and our one French wine, a true Champagne called Ayala. Along the front window, in the corner and in the first column, you can see the biggest change from when we first opened our doors: food, spices and recipe books! Our mission is not only to represent the culture of Latin America through wine, beer and spirits, but also through food and gastronomy. When we first opened, we hadn’t yet found the right goods to fulfill this part of our mission. Now we have! All throughout the store you will find food products that fit this bill, from chocolate to plaintain chips to quince spread! If you keep walking, on your left will be our “Daily Cata” counter, where starting at 5pm during the week, and 3pm on the weekends, one of our Catadores will happily pour you what we’re sampling that day. The “Daily Cata” can range from wine, to beer, to spirits, to cocktails, and we often include a little snack as well! On Saturdays, you can purchase whatever we sample here for 10% off! The island is the largest section of the store, acting as a bridge from the Old world to the New World. On the counter near the register we have a rotating selection of delectable snacks, including dried meats, olives, Quicos, almonds, and chocolate covered figs. Among these you’ll encounter fun gift ideas, like Champagne scented candles or gourmet single origin coffee from El Salvador. Our liquor, liqueur, aperitif and amaro selection rests on beautiful stainless steel shelving. The first column is Rum, the next Agave spirits, followed by Pisco and Whiskey, then Aperitifs and Amaro, finishing with Brandy and Liqueur. At the very end of the shelves, we’ve placed our “Natural WInes“ section. Please note you can walk along the back of the island to get a better view of our spirits. Located in the back right of the store as you enter, we hand select our beers based on style and season. Some are from Latin America or Europe, and some are from the US, with a few being locally produced as well. Along the back wall you’ll find our “Hall of Fame,” where some of the greatest wines from all the regions we represent are displayed. These are all sublime, from Argentine Malbecs that will put the whole “Malbec Craze” into perspective, to Magnum sized bottle of classic, aged Rioja Gran Reserva. After exciting the “Hall of Fame,” you will pass a fridge with chilled whites, roses and sparklers. After that, you come to our Vermouth and Fortified wine section, which features all types of Sherry, Port and Madeira, as well as additional offerings from Latin America and Europe, such as Rancios from Catalunya. At Grand Cata, we want to foster a sense of community. A centerpiece of the store is our huge communal table, which we use to host wine classes, which often involve the winemaker. You can also reserve this table for a private event and we will work you to pick out a theme to learn about. For instance, if you’ve visited Chile and would like to expand your knowledge of wine from there, we’d would love to make it happen! All we ask in this case is for 48 hours notice. When we are not hosting events, the table displays seasonal wines and cocktail ideas. Also in this section you’ll find our cheese cooler, cocktail ingredients, bar accessories, and more spices. The cheese cooler also contains dessert wines that pair fabulously with the cheeses, as well as sausages and cured meats. And yes, we have jamon serrano here! So there you have it! Grand Cata one year after our grand opening. We’ve learned a lot from you, our customers, and have enjoyed every minute of the ride so far!